The more I make "refrigerate overnight" breakfast casseroles the more I appreciate them. They give me time to relax and enjoy the company of my family and friends instead of being tied to the kitchen cooking. All I had to do was put the casserole in the oven in the morning, no muss, no fuss. I made this casserole for our Christmas brunch and everyone loved it. 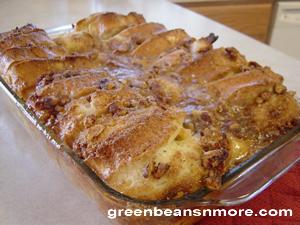 This is the Baked French Toast Casserole I made for our Christmas brunch. Some in my family can't eat nuts, so I only made 1/2 of the Praline topping. Next year I will make the full amount of the Praline topping and just add nuts to 1/2 of it. This dish was so moist that some didn't use Maple syrup with it. Slice French bread into 20 1-inch slices. Arrange slices in a generously buttered 9 x 13 inch flat baking dish in two rows, overlapping the slices. In a large bowl combine the eggs, half-and-half, milk, sugar, vanilla, cinnamon, nutmeg and salt and beat with rotary beater or whisk until well blended. Pour the egg mixture over the bread covering all the slices evenly. Spoon some of the mixture in between the slices. Cover and place in refrigerator overnight. Combine all ingredients and blend well. Spread Praline topping evenly over the casserole. Bake 40 minutes, until puffed and lightly golden.